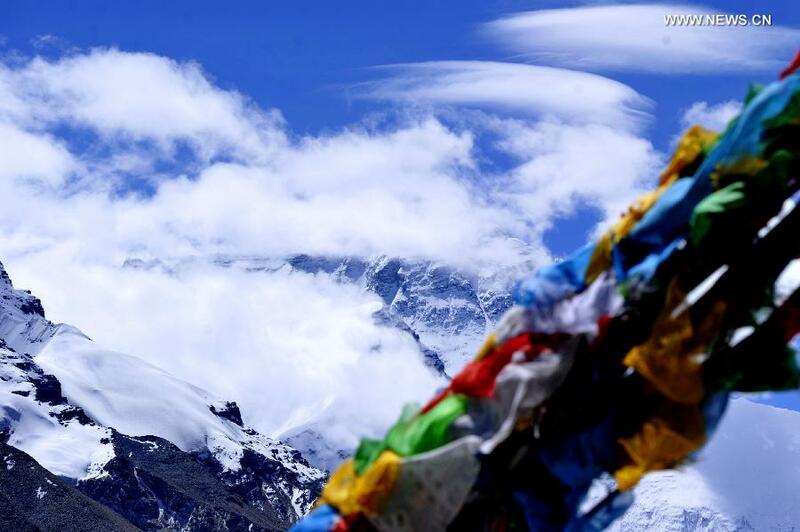 The Living Tibetan Spirits Make a Dream Trip to Mount Everest. As my miserable mortal life journey crawls towards its end without giving me any clue about my destination, I can only afford to make a dream trip to Mount Everest. I give my thanks to photographer Bruce Connolly and ChinaDaily.com.Cn for sharing with me the story about ‘A Road Trip Across Tibet to Mount Everest’. In my analysis, Mount Everest or Qomolangma is my mighty witness testifying in support of true Tibetan Identity. Mount Everest proclaims that Tibet is never a part of China. 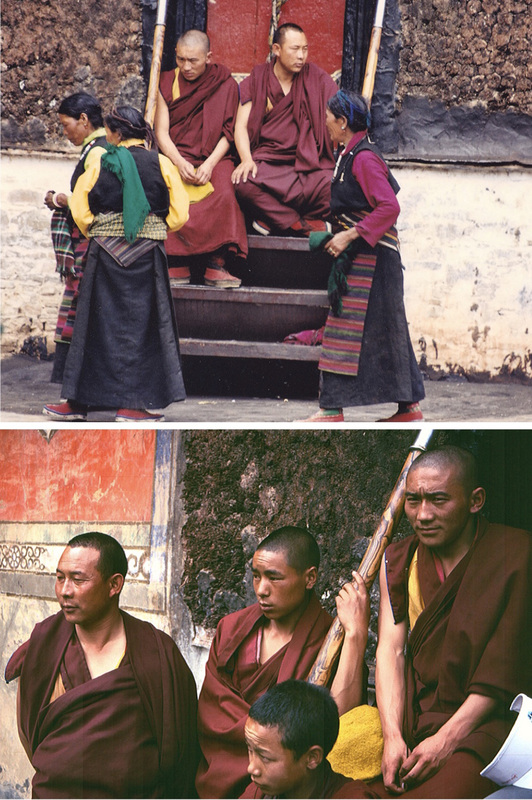 In 2000, Lhasa was a different city in many ways, compared to what it is today. 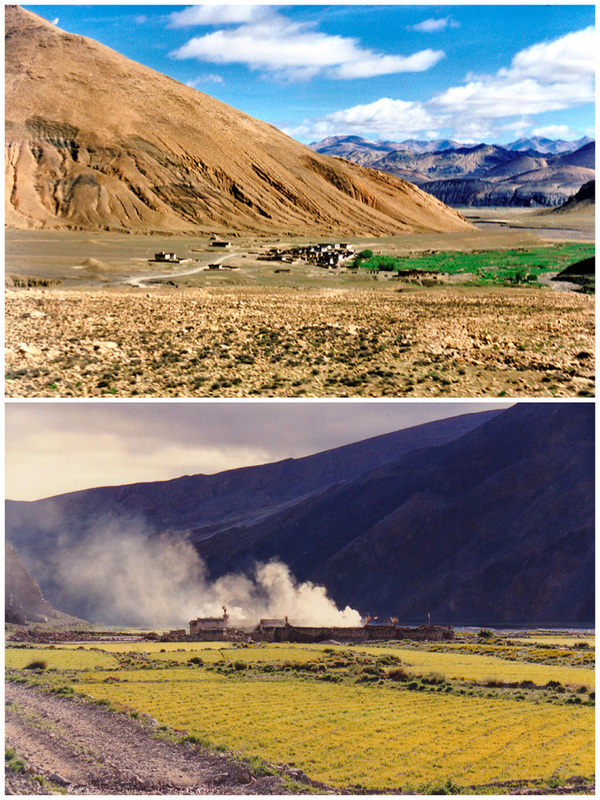 High on the Qinghai-Tibet Plateau, it was much more isolated back then. Its airport, a roughly 90-minute drive from downtown, was at that time the only one operating across all of Tibet. In earlier years, flying into Lhasa had been restricted to early morning flights from Chengdu in Sichuan. By 2000, however, it was well-served by modern, powerful jet aircraft capable of landings and takeoffs at high altitudes, able to cope with occasionally difficult afternoon weather conditions. In recent years several new airports have also opened across Tibet. Despite the advances in aviation technology, flying into Tibet was expensive. 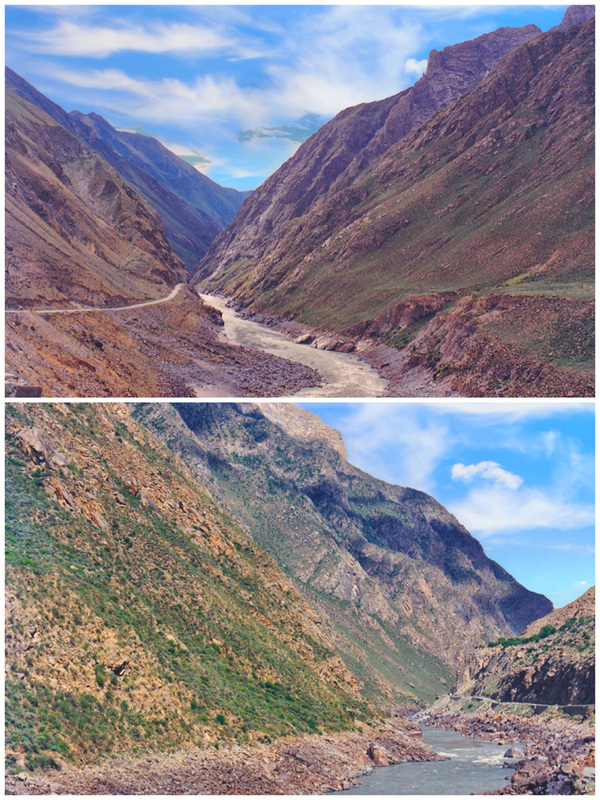 Before the completion of the Tibet railway in 2006, roads were the only feasible option for most freight and passenger traffic. It amazed me during my time in Lhasa how so much that made my stay both pleasant and comfortable must surely have come up to the city by road. 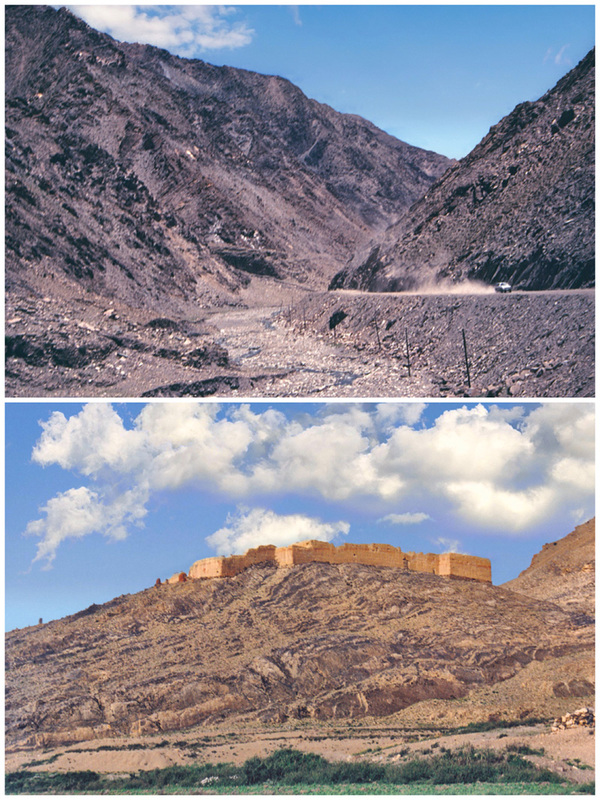 Two main highways served Lhasa at the time. 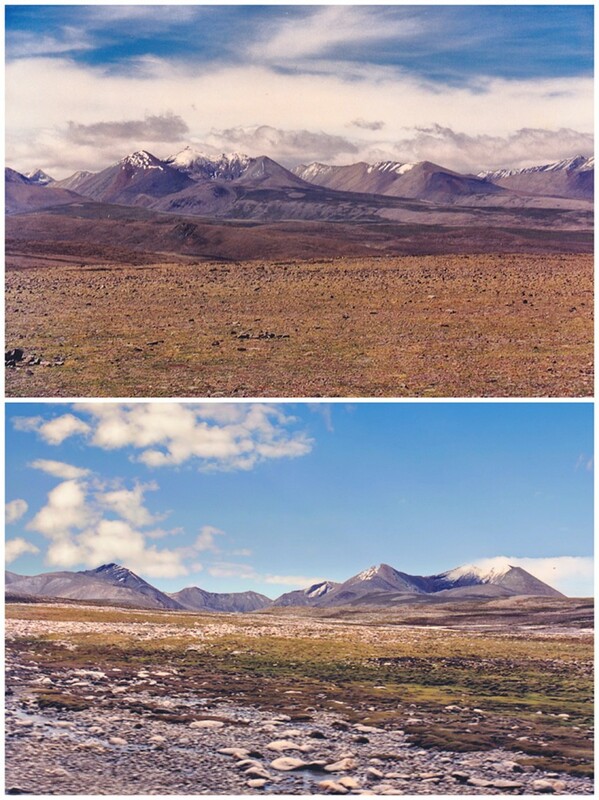 From Golmud to Xining, Highway G109 was a long, lonely journey through an empty upland plateau. The other route, Highway G318, runs 5,476 kilometers from Shanghai’s People’s Square, via Sichuan and southeastern Tibet ultimately to Zhangmu, the border crossing with Nepal. 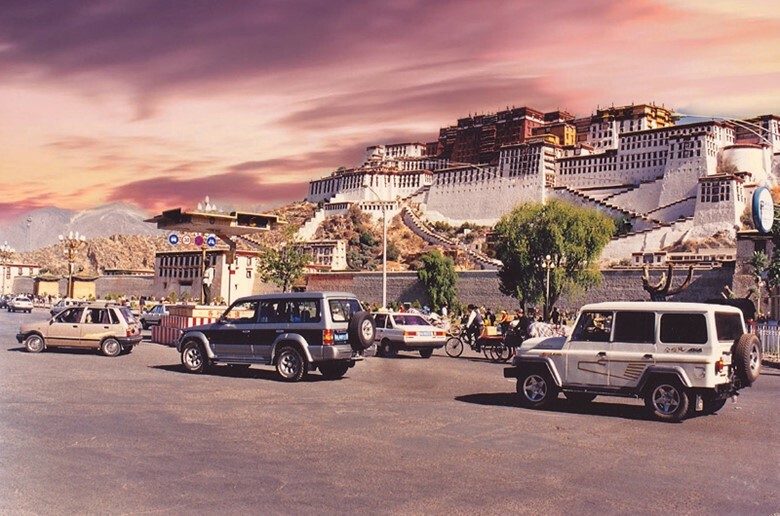 I would leave Lhasa along G318 on a road trip initially to the base of Qomolangma, known in the West as Mount Everest. I noticed several oxygen bags loaded into what was a comfortable but strong SUV. Lhasa was modern and well-planned, but outside the city, infrastructure such as road quality was quite variable. 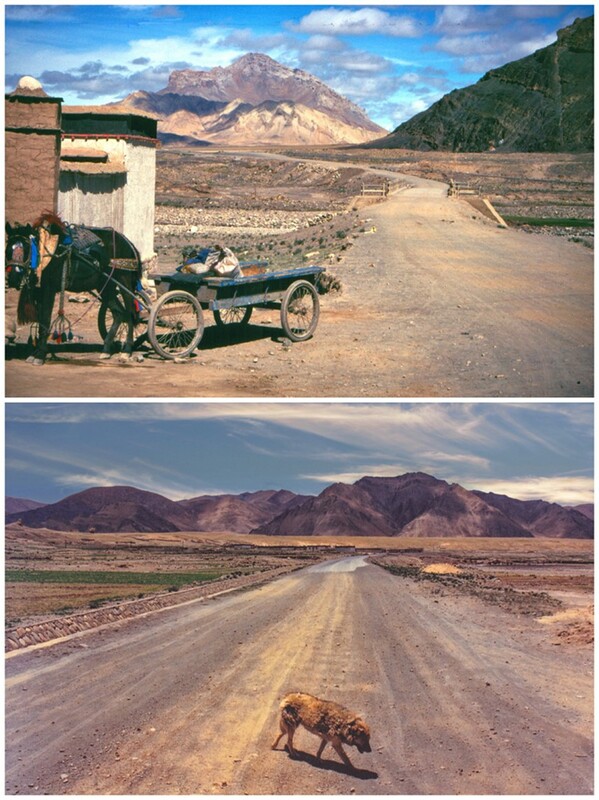 The physical terrain often proved very challenging for highway construction, even between Lhasa and Xigaze, Tibet’s second city. Geologically, much of the area is still active. Landslides remained a danger during the rainy season. Initially, my departure from Lhasa along G318 followed the road that had brought me a few days earlier from the airport. Nearing the Yarlung Tsangpo Bridge, we turned right for Xigaze. Initially, the route followed a wide valley and the river braided into many channels, with sweeping views toward glacial mountain peaks and ridges. Villages sat near intensively cultivated, irrigated farmland. Then it started narrowing, with scenery becoming increasingly breathtaking. Settlements perched on any patches of level terrain available. The road started along a ledge cut below almost vertical cliffs. High gullies were filled with long fingers of snow. Below the road, sheer drops reached the river that appeared to be cascading around huge rocks. Workers tirelessly cleared fallen boulders from roadside ditches. Flocks of sheep and goats also shared the road space, with drivers carefully edging past. 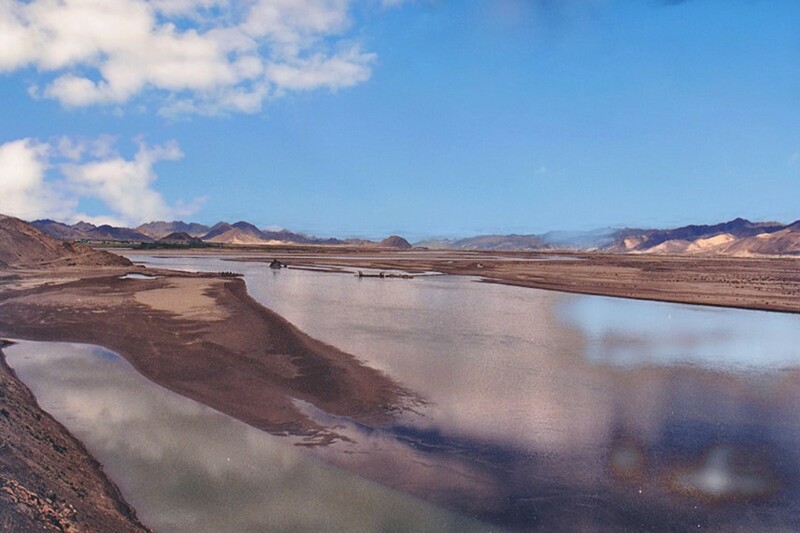 Gradually the valley widened, and the river slowed, allowing flat-bottomed ferry boats to carry villagers across. Both road width and quality improved. Where bridges spanned river junctions, small restaurants and shops had opened, providing supplies for travelers. At intervals, pack horses gathered beside narrow trails leading to seemingly inaccessible villages. Eventually, the valley really did widen and the waters calmed, becoming almost lake-like. A tugboat pulled a pontoon carrying vehicles across to the far shore. Some of the landscape appeared as a small sandy desert with protective trees planted along the highway. I noticed poles being erected to carry electricity to some villages while concrete-lined aqueducts helped irrigate reclaimed land for arable farming. Rounding a bend, I saw a concentration of modern buildings, some even medium-rise. We arrived at Xigaze, at an altitude of 3,836 meters, the highest city I had ever reached. Since that 2000 road trip, travel to and from Xigaze has greatly improved. Not only has the road been upgraded but the railway has been extended from Lhasa and a modern airport opened. Partly in response to such infrastructure investments, tourism has grown significantly, not just to Xigaze but across much of Tibet. I stayed at the Xigaze-Shandong Hotel, which then was the city’s tallest building. I discovered at that time a certain arrangement existed, where the more developed parts of China were paired up with areas of Tibet to assist in regional assistance programs such as infrastructure projects. Xigaze had relationships with Shanghai and Shandong, Lhasa with Beijing, and so on. It was an unexpected joy to find excellent accommodation in what in theory was then a remote location. After a spicy Sichuan-style lunch in the hotel, I spent the afternoon visiting Tashilhunpo Monastery. 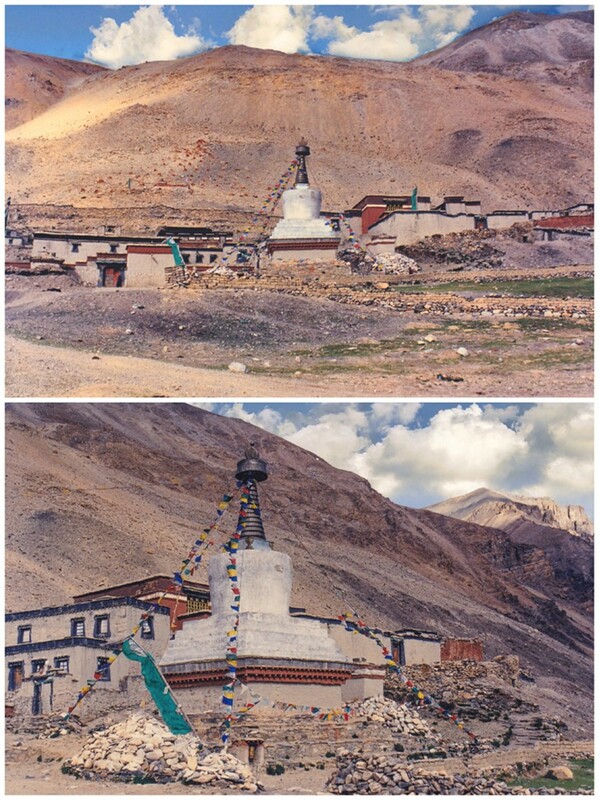 Founded in 1447, it was the traditional seat of the Panchen Lama — Panchen meaning “great scholar”, the title bestowed on the abbots of Tashilhunpo. I was spellbound by the magnificence of the monastery as I walked through its halls illuminated by trays of butter lamps. One chapel was home to a 26-meter-high copper image of the Maitreya, or Buddha of the future. Around the walls were around 1,000 gold paintings of the Maitreya. Within an assembly hall dating from the 15th century, chanting monks sat on carpets while above them long thangka images and colored scarves hung from the ceiling. A large throne in the middle was where the Panchen Lamas once sat. 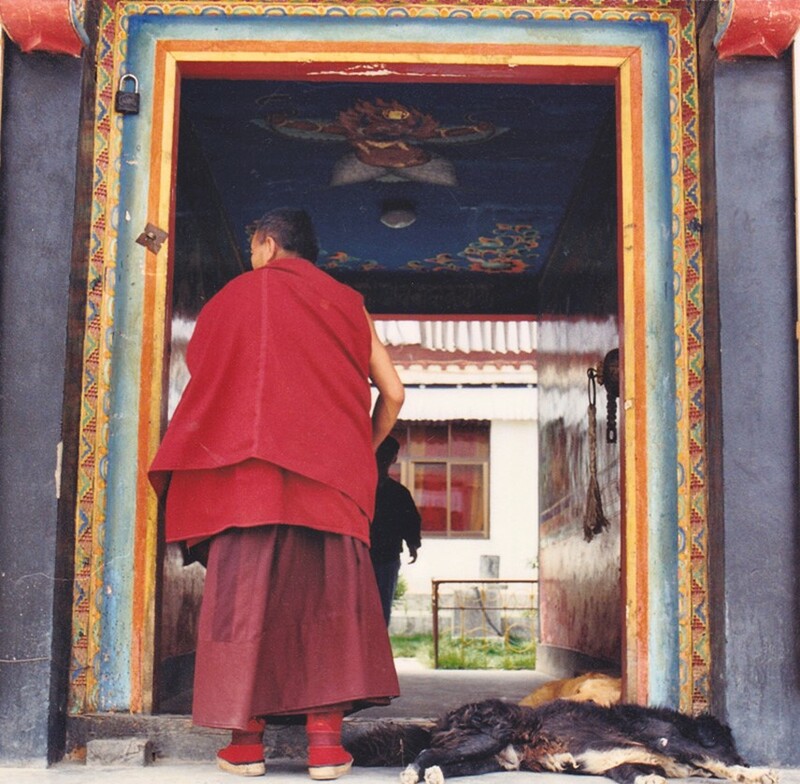 I wandered the alleys between prayer halls crowded by people chanting, prostrating themselves, walking clockwise along balconies or spinning personal prayer wheels. Some, along with young monks, scooped up chunks of butter from large bowls and smeared it into lamp bowls. The butter produced a distinctive aroma that seemed to permeate everywhere. 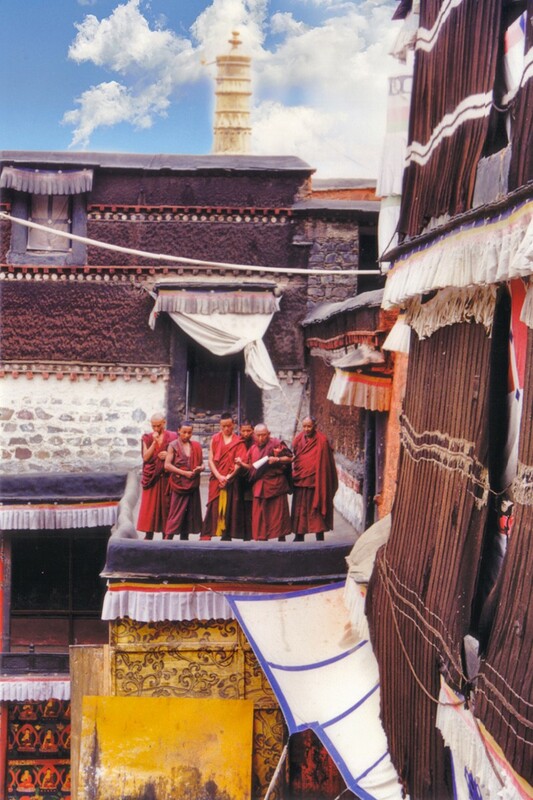 Above the monastery’s perimeter wall, people quietly followed the Tashilhunpo Kora (pilgrimage). That evening I tried writing in my diary but found it a challenge because I had experienced so much throughout the day. I did realize that this hotel would offer the last comfortable bed for the next few days, as there were no more cities ahead on this route, with only small trading towns and to look forward to. Leaving Xigaze early next morning, I saw many people already walking around the monastery. 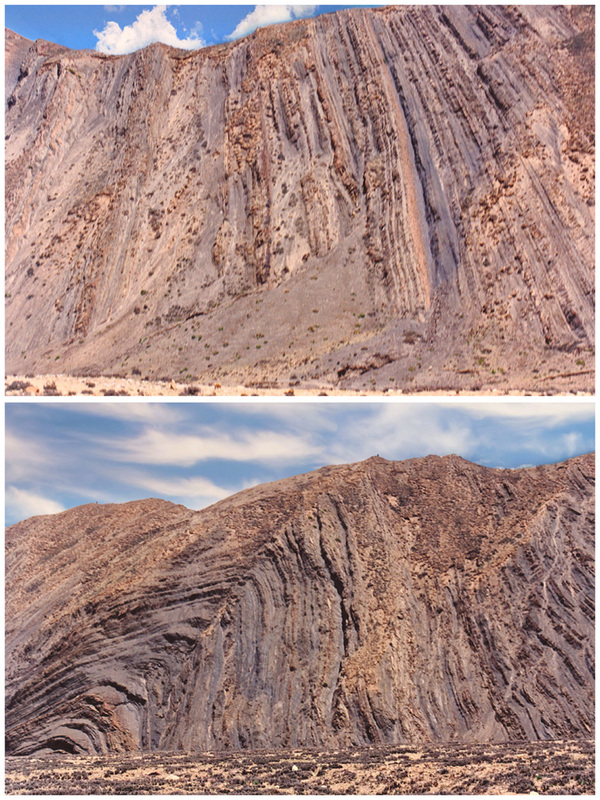 The road was initially unpaved, passing many exposed multicolored rock formations that stood as a testament to the massive tectonic movements that had uplifted the area’s geology. The land became increasingly dry with small patches of cultivation, mostly barley and potatoes, where water could be sourced. Occasionally someone on horseback would tend herds of black-coated yaks. 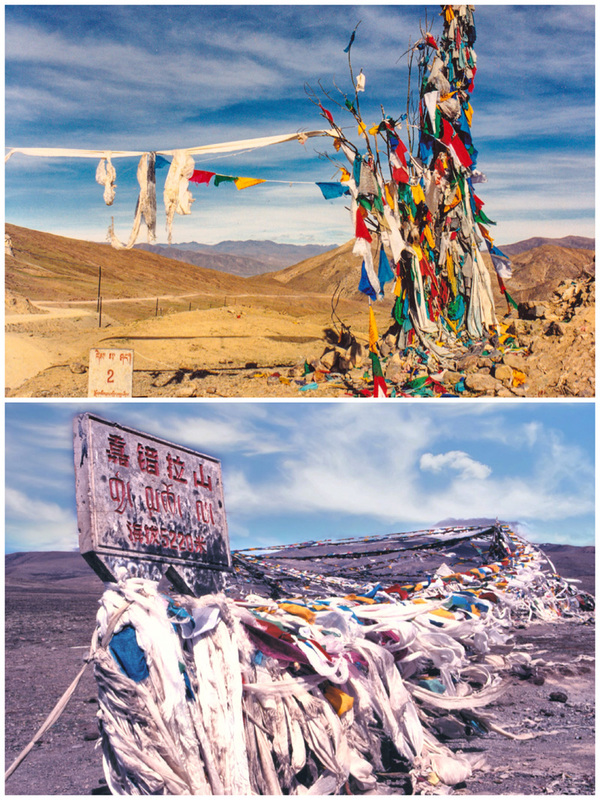 The road would climb up and over several passes usually crowned with prayer flags, such as the 4,500-meter-high Tso-La Pass and the 4,950 meter-high Yulang-La Pass. The visibility was so clear, giving excellent views of distant peaks. At one point I saw the heavy walls of what had been a fort guarding a pass. Descending, lower areas would have limited cultivation, although I did observe groups of farmers scattering seed potatoes onto plowed soil. Ponies pulled wooden carts along the farmers. Along G318 there also was a regular procession of blue trucks laden with goods, for this road was also the main lifeline to western Tibet. 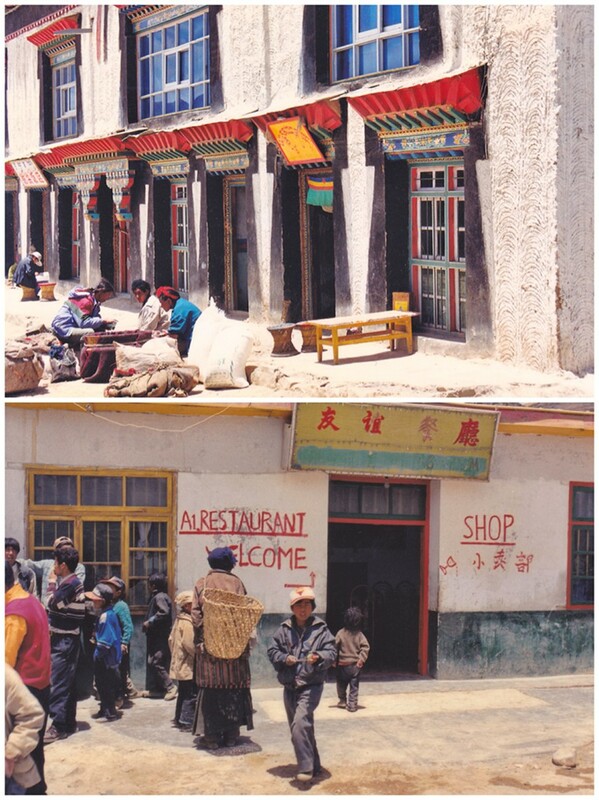 Some 150 kilometers from Xigaze is Lhaze, a small county whose main street had many small restaurants with name boards in English such as “Chengdu Restaurant”, for it was where G318 to the Nepalese border splits from the highway to western Tibet. Apparently, travelers heading up toward Mount Everest maybe would stay one or two nights, for it was the last real town on the route. The road climbed again up a narrow valley where herders would camp while tending their yaks. 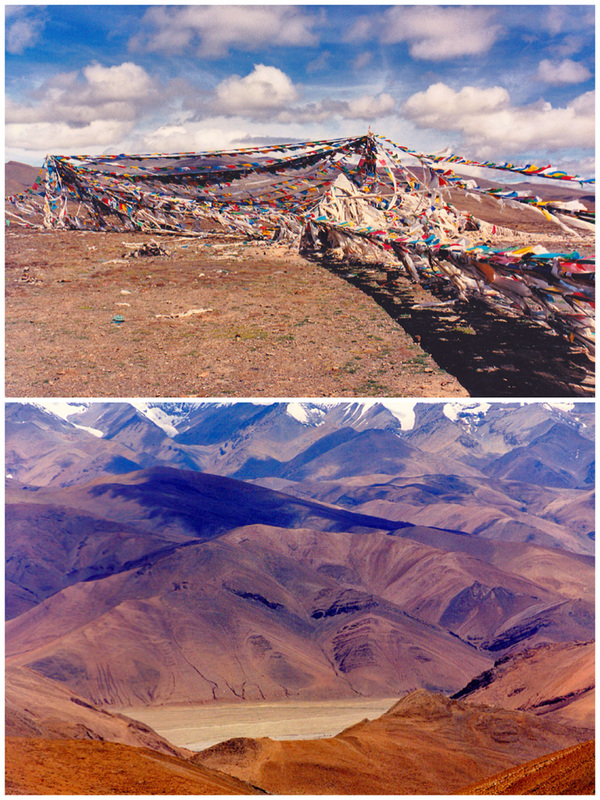 This led up to Gyatso-La Pass, at an altitude of 5,220 meters, one of the highest along the route. Stopping briefly, I thought it was amazing how people gathered around, yet there was no sign of any habitation. The landscape felt like arctic tundra vegetation, and beyond it, I could finally see the snow-capped peaks of the Himalayas. However, clouds were building up over those peaks for the monsoon would soon push up from the Indian sub-continent. In this area, the road was not surfaced and it was a constant struggle for work crews to keep it open. When we reached distance marker 5,115, a sign declared we were entering the Mount Everest Protection Area. Scattered trees indicated the approach toward a small village, Tingri, where the main road turned off to Shegar. Notices proclaiming “guesthouse” and restaurant adorned building exteriors signaled the area was used to visitors. I had lunch in a restaurant that amazingly had television, hi-fi, and a fridge! Boys tried to sell fossils dug up locally while people gathered for onward transport by truck or bus. Soon after the village was the 63-kilometer route leading up to Mount Everest. As we drove gradually higher, I was enthralled with the geology exposed everywhere, often showing bedding planes of the rocks tilted vertically. That gravel road gradually climbed up through a wide valley with an increasing sensation of being on the roof of the world as we reached the 5,120-meter-high summit of Pang-La Pass. Beyond it lay one of the most spectacular views in the world. 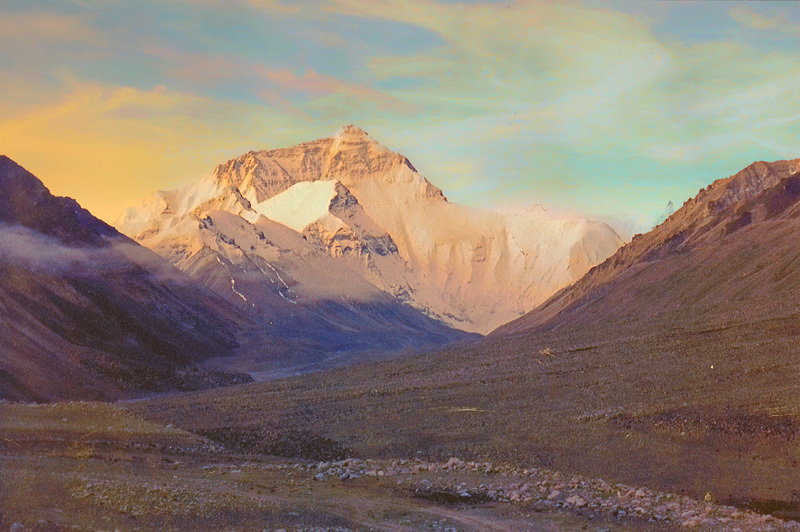 Along the horizon stood the glacial peaks of the Himalayas, with Mount Everest, or Qomolangma, at the center. It was so stunning I could easily have stayed there all day. 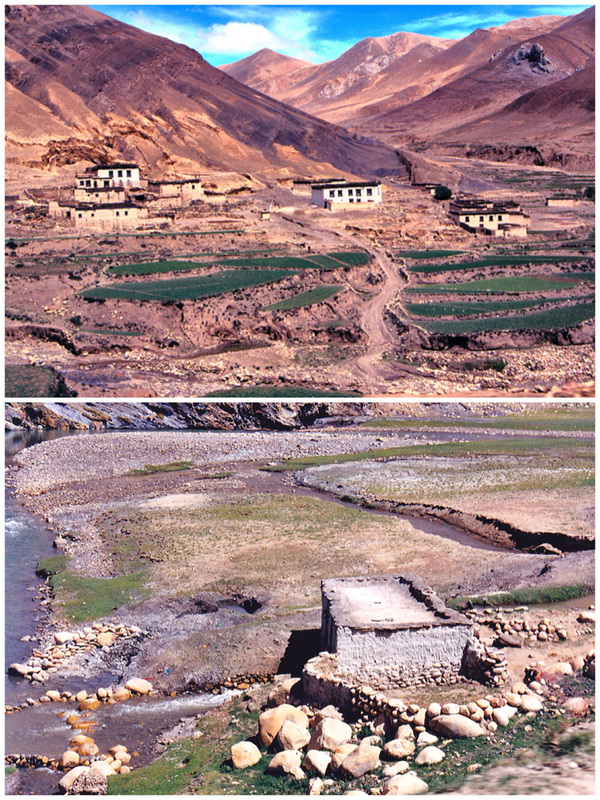 From the summit, the road descended through a moon-like landscape reaching a small agricultural village, Tashi Dzom. Notices again in English advertised accommodation and dining. 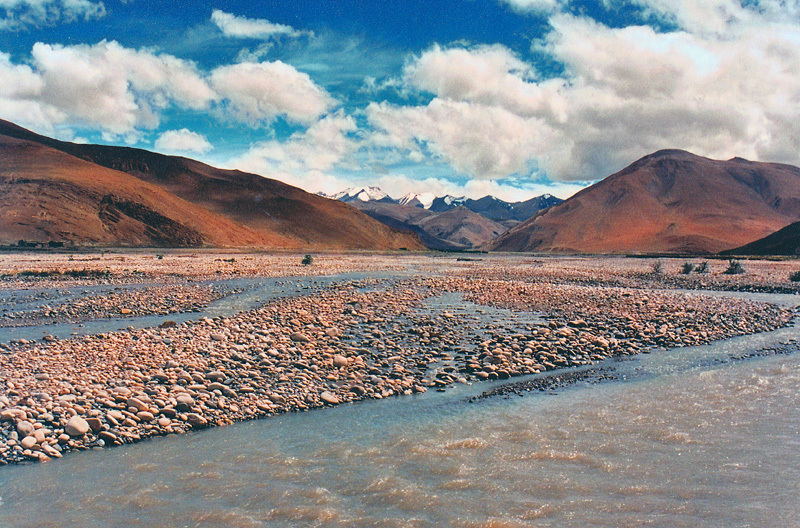 Turning right into a broad valley, we encountered a river spreading over a wide terrain of gravel and stones, which was actually meltwater draining off the northern slopes of Mount Everest. Jeeps carrying tourists descended as we headed higher, passing Chodzom, possibly the world’s highest village, again offering a hotel built in a local Tibetan style. The route went up through boulder fields, the descending river now milky white as it carried so much gravel and crushed stones. At an altitude of 5,030 meters sat Rongphu Monastery, the last inhabited building before the base of Mount Everest. I would stay there overnight, but first, the last section of the road had to be skillfully accomplished. The going was extremely rough, bumping over many rocks and glacial debris while driving through streams. 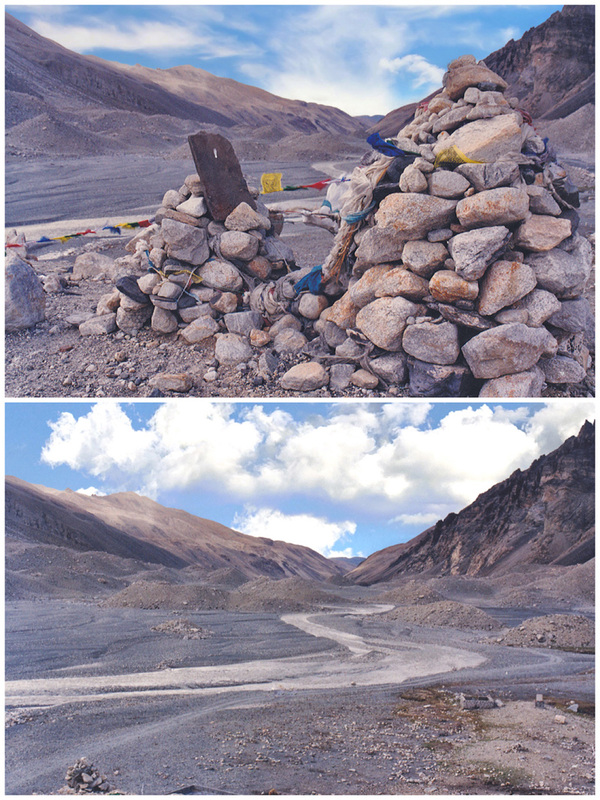 Great mounds of stones and silt had been carried down and deposited by the Rongphu Glacier. Reaching the road’s end, I found myself lacking the energy to manage anything beyond a slow walk up a gravelly hill. 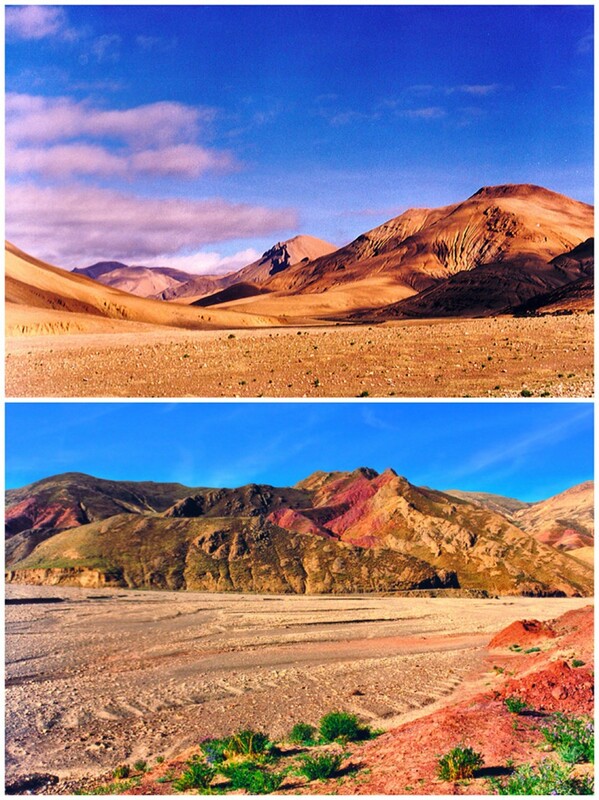 There was no vegetation on this stark landscape, but it was very inspiring. My only disappointment was that Everest was wrapped in clouds. It was windy and felt very cold. I returned to the guesthouse for a simple meal of egg fried rice and pot noodles, and went to bed, trying to sleep, an almost impossible task. This proved fortuitous. As dawn was breaking I went outside for a glimpse of the grandeur of Mount Everest exposed before me. I sat on a rock trying to take it all in, the world’s highest peak. At last, I had arrived at this breathtaking vista, which I had seen so many times in books from years back. Within 30 minutes the clouds once again enveloped it! I enjoyed a simple breakfast, and then weathered a bumpy descent as villages such as Chodzom were waking up. I watched people heading out to the fields, some by horseback, and children going to school. Back over the Pang-La Pass, with its many prayer flags, it felt like time for a memorable look back toward Mount Everest, sadly almost obscured by clouds. Soon we returned back to the G318, stopping for lunch at Tingri before arriving in Xigaze once again. I had accomplished an incredible journey, thanks in part to the amazing skills of my Tibetan driver.